Moral philosophy has long been dominated by the aim of understanding morality and the virtues in terms of principles. However, the underlying assumption that this is the best approach has received almost no defence, and has been attacked by particularists, who argue that the traditional link between morality and principles is little more than an unwarranted prejudice. 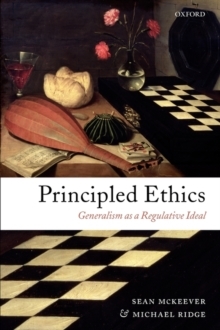 In Principled Ethics, Michael Ridge and Sean McKeever meet the particularist challenge head on, and defend a distinctive view they call 'generalism as a regulative ideal'. After cataloguing the wide array of views that have gone under the heading 'particularism' they explain why the main particularist arguments fail to establish their conclusions. The authors' generalism incorporates what is most insightful in particularism (e.g. the possibility that reasons are context-sensitive -'holism' about reasons) while rejecting every major particularist doctrine. At the same time, they avoid the excesses of hyper-generalist views according to which moral thought is constituted by allegiance to a particular principle or set of principles. Instead, they argue that insofar as moral knowledge andpractical wisdom are possible, we both can and should codify all of morality in a manageable set of principles even if we are not yet in possession of those principles. Moral theory is in this sense a work in progress. Nor is the availability of a principled codification of morality an idle curiosity. Ridge and McKeever also argue that principles have an important role to play in guiding the virtuous agent.